The VFD Nittenau is running a First Responder system in its town. This means, a First Responder unit (usually two especially trained members of the VFD Nittenau) is alarmed when there is a medical emergency situation in Nittenau. 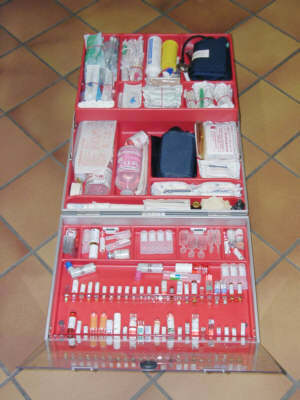 This unit can then give qualified advanced first aid to the patient until the ambulance or an emergency doctor arrives. The unit can also support the emergency personnel. It doesn't mean that any job is taken away by our fire department members, further treatment or transport will still be done by the paramedics or emergency doctor. The First Responders are most important in situations like resuscitation, cardiac infarctions, standstill of breathing etc., when every minute counts. As in Nittenau there is no ambulance and it can take long for an ambulance to arrive, the importance of a First Responder unit is evident. In the USA First Responders are more common than in Germany, here there are only a few First Responder units, provided by different organizations like volunteer fire departments, real fire departments, Red Cross etc. 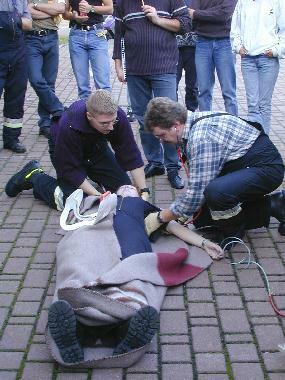 In order to start this system in Nittenau, about 20 department members got a basic paramedic training in 2001, more were trained in the following years. Some of them are part of the regular rescue service. 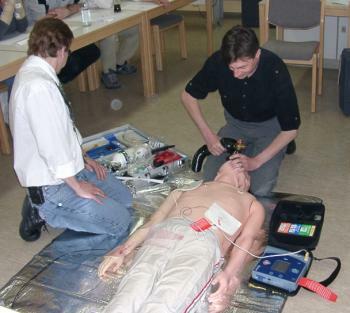 Every half year there is training in automatic external defibrillation. In 2000 the VFD Nittenau bought a used vehicle for the First Responder unit. Until the First Responder service started it was used as command vehicle. 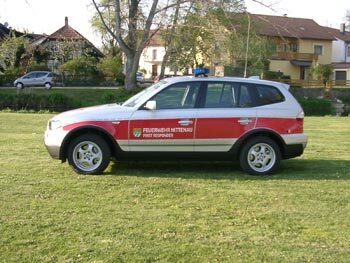 In 2006, thanks to the generous donations of the companies and citizens of Nittenau and the support by the city of Nittenau, the first vehicle could be substituted by a new BMW X3. It started its service in april 2007 (see photo below). The VFD Nittenau needs EMS equipment like trauma kits, breathing kits, automatic external defibrillator etc. Any donation for these expenses is highly appreciated. "Trauma" case. Containing infusion sets, syringes, blood-pressure cuff, stethoscope, sterile pads, bandages, tape, ampules etc. 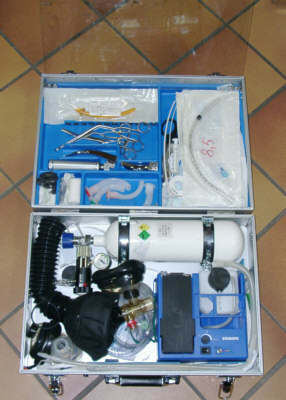 The "breathing" case contains oxygen-cylinder, resuscitator, different masks, electric suction unit, airway management kit, tape etc. The First Responder service started on 08/11/2001, 07.00 p m.
An official initiation was on sunday, 09/09/2001 at the VFD Nittenau open house event. Do you have questions, own experience or suggestions to the subject "First Responder"?